Kids, look for these signs! Last chance this week to eat at Howard's Pub; other restaurant closures coming up after Veterans Day. Happy Halloween! It's Trick or Treat night! Last year, Angie Todd (of Angie's Gym) started a campaign to get the trick-or-treaters to branch out from the Lighthouse Road loop into the rest of the village. Angie lives on Sand Dollar Road, and she and neighbor Jason Wells lured kids to their 'hood with good candy and a haunted yard. 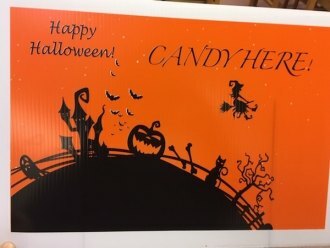 Angie also purchased "Candy Here" signs so that kids would know at a glance where the treats are. "I want the kids to Trick or Treat the whole island," she said. "Last year was a smashing success. I know the kids went places last year they had not gone to before. Hopefully, as it becomes more and more common to trick or treat the whole island, they'll go everywhere." Spread out! Share the love! Go all over! And please stop by the library between 3-8 for candy and library prizes! 6:30pm: Meet & Greet with candidate D. Cole Phelps @ the Castle on Silver Lake. 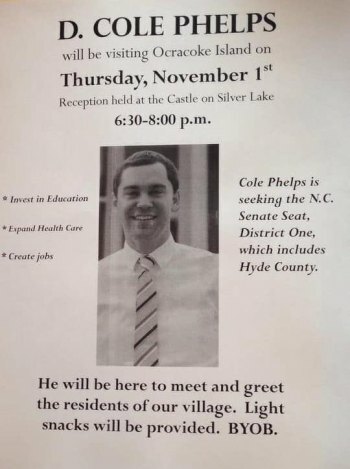 Cole is seeking the NC Senate seat for District 1 (which includes Hyde County and Ocracoke.) All are welcome to come out and meet him. Snacks will be provided; BYOB. Note: This week's concert @ Coyote Den is cancelled because Coyote is on the road! 2am: Set your clocks back an hour! Daylight Saving Time ends. Savor that extra hour of sleep.